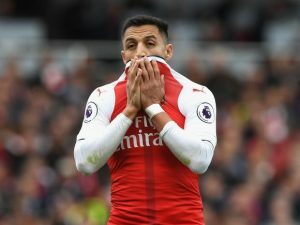 With very little time left in the transfer window, Alexis having to go and join up with his international team-mates has caused complications, especially with rumours that the striker has handed in a transfer request, while at the same time it has been reported that Man City have come in with a new offer to sign Alexis and to include Raheem Sterling as part of the deal. This is looking even more certain that we are going to lose our talisman, despite Wenger’s continuos assertions that he would definitely be made to stick to hthe final year of his contract. He also stated that Sanchez would not be allowed to move to a rival. Where does this leave Wenger if it’s true? News coming in is that Liverpool have made a£70 bid +Origi for Lemar.I told you guys their first bid of £55 would be rejected yet you doubted.His price has increased significantly due to the lateness of the window.This bid is likely to be accepted. Where are those who said their first bid(£55) was being considered according to the media? ?Wenger wss right to not sign Lemar but he should’ve signed Draxler or Mahrez who imo are better than Lemar.We’re still not close to signing anyone yet but probably Sancho. 30 million for Lemar?? I don’t believe Sky has got their story right. Or maybe the Lemar bid was just smokes and mirrors. Maybe they weren’t at all interested in signing anyone else after Lacazette seeing as they’d wrongly assumed than Alexis would just ease off and wait out his contract. Well it certainly appears that Sanchez will leave regardless of what Wenger says. Wenger tends to be economical with the truth so I can’t say I expected any better from him. I just hope Ozil is shipped off as well and does not walk away for free after all the trouble he has put us through with his languid displays. So basically Wenger has once again lied to millions of fans. Nothing new here. I never took Wenger’s words for it regarding the Sanchez situation because one way he is a business man and needs to put it out that he won’t sell so that he can get a higher price for him, on the other hand there is arrogance and pride at stake where he will not be allowed to look a fool having a player on his team, especially one of Sanchez’s calibre, to want to abandon ship. He still believes or refuse to believe players want to leave Arsenal and in some way blinded by the fact that these players perhaps don’t want to play for him. It’s like having another Theo Walcott. All speed and no footballing brains. We’re screwed people. Really screwed! So we’ve waited all summer.. to replace Alexis Sanchez with Sterling?!!! If the board sanctions this deal, Wenger should just resign in protest… I believe he loves the club so much. Now he must show it. And WTF do we need Welbeck for exactly??? i am ow really confused, our defence is a shambles, so we let gabriel go, and now it looks like Mustafi is going… WTF… Wenger has totally lost the plot, next we will see lafayette as centre-back when Kos is out injured again….. our team is managed by a mental senile pensioner who has lost the plot. oops, meant to be Lacazette, not lafayette! !… damn spell check !! Good point, and in I’m still waiting for all those AKBs to come and join the fun, they seem like they are hiding, isn’t this what they expected when they were bashing those who wanted Wenger out? Where are you geniuses???? when 60 mill + is on the table !!! Time to cash in get shot of the dissatisfied, want away’s, injured, old and under performers. or to PSG with Draxler coming the other way. You may ask why not Giroud Ramsey Xhaka and Walcott? Giroud and Walcott are both prats but their stats are decent. Xhaks is new and I believe Ramsey deserves one more chance. Saved salaries = 39 m .
Arsenal is a piece of cake right now and every major club coming with a knife to have a slice…what a pity! “This is an update for the fans about my current situation. I have kept quiet all this time out of respect and loyalty for the club and as agreed with Mr. Gazidis and Mr. Wenger, but since there is so much speculation in the media, I think it is fair for you guys to know what’s really going on at the moment. “As announced earlier this year I had a meeting with the Boss and Mr. Gazidis after the season. This was a meeting about the club’s future strategy and their policy. Financial terms or a contract have not been discussed, since that is not my priority at all. “Out of my huge respect for Mr. Wenger, the players and the fans I don’t want to go into any details, but unfortunately in this meeting it has again become clear to me that we in many aspects disagree on the way Arsenal FC should move forward. Truth has never at any time been sweet. This was RVP telling the truth as he saw it first hand, and from an insider’s point of view. I think Sterling is an alright player, but are you serious? I’d like to see Wenger coming to the Emirates on the back of Alexis being sold. Hopefully this is something the fans will not forgive and ask for him to leave once and for all. I started supporting Arsenal in 1950 by chance (when I was 10). A friend invited me to watch the cup final on TV in that year and we beat Liverpool 2-0 and so I became a fan. 67 years later I am still a fan and would never dream of supporting anyone else. Having said that, in all my years of following the team I believe our perfprmance last Sunday was inept, abject and woeful. Whilst I will accept us losing to any side that outplays us, I will never accept a performance where 100% was not given by every player in the team and that was the case against Liverpool. It is regrettable, but understandable that there are players who are not willing to renew their contracts within the present structure. We must sell anyone who does not wear the Arsenal shirt with pride, even if it does mean we sell to our rivals. This year could turn out to be disastrous, but if it leads to changes within the club then it may be a blessing in disguise. Whatever the outcome I will never change my allegiance even though at 77 perhaps I should know better! Kallstromm would definitely be joining us.. only after its been confirmed his back injury will rule him out for just 3 months and not 8 months as previously feared. Mustafi for a plate of spaghetti. That might just be the real reason we are letting him go to Italy. I can’t find any other reason within the realms of logic and mental sanity. No to Sterling, get the best out of the Alexis deal, and use that money, and more if needed, to get draxler, offer him 250 a week, since we can’t offer him champions league football, but my problem is that whoever we sign, wenger will still play them out of position..
..i think sterling would be laughing in amusement with no intention whatsoever of being seen playing europa league football much less fighting relegation spot with players that don’t have any fight. sterling to arsenal needs to be put back to bed (…jus sayin). why do we not reject Sterling and ask for Veira he is a beast in midfield a leader who will bring a bit of steel into the midfield and organise everyone on the pitch.I know he is near the end of his career but he would be an improvement on who we have. Mr. Specialist is a pathological liar. A clue though he always say the opposite of what will happen. And Sterling… No please, we already enough share of ‘all action, no results’ players. We about to sell one and replace it another… Kronke should put all the profit in his pocket. If all that I am hearing is true then Wenger indeed needs a psychiatric examination! What is all this nonsense that is going on? Is the Club being disbanded? You sell Gabriel, Mustafi, Oxlade, Sanchez, Gibbs etc without bringing in replacements? Does Wenger want to destroy the Club and then go away or what? Can someone find out from him what his plans for this season are. I believe many fans are lost as I am.